I got the go ahead from the physio to do my long run of 20 miles this weekend. Well what he actually said was “I’d recommend 9 or 10 but since you did that last night, you should be ok with a longer distance.” However, with the strict proviso that should my knee start hurting, I should start walking. I tried explaining that it hurt less to run than walk but he fixed me with a beady eye and told me to do what the hell I was told. OK I’m paraphrasing, but that was the meaning behind it. Luckily my stomach is quite forgiving and it actually worked OK as a pre-run meal. Not sure I can recommend it with a clear conscience though. Decided to use Draycote Water as my route and run laps of the reservoir then veer off down a footpath if I got bored. I did 2 laps going alternate directions at marathon race pace so kept it 8min/mile - 8.30min/mile and then did half a lap at a comfortable pace and went off to find a footpath. There was one about half a lap, just before the last long straight. Ran down the Birdingbury cycle route which was lovely and smooth – not too many cyclists either - and there were dragon flies and butterflies everywhere. Much prettier than the usual flies and they didn’t seem to have the suicidal urges the flies did – getting in my mouth and eyes all the time. I did see a few cyclists though, including a couple who kept going the wrong way and asking me for directions. I wasn’t going fast enough to overtake them but they went the wrong way at every intersection so I must have seen them 3 or 4 times. Must have looked like a running version of Mike Myers from Halloween. Not fast, but they couldn’t get away! There were quite a lot of people bramble picking. Mmm … I love blackberries but halfway though a long run wasn’t really an appropriate time to gather fruit and I didn’t have anywhere to carry them except my mouth. Decided not to follow the route all the way to Birdingbury as didn’t want to run on the road so followed the trail but it petered out into a rabbit run between stinging nettles and thorny bushes which wasn’t doing wonders for my speed so I turned around. I was alternating High 5 gels and slices of Mars Bar to see how I got on with them as a fuel for the marathon. I didn’t feel particularly tired and didn’t hit the ‘Wall’ although I ran out of water at mile 15. I struggled about ½ mile from the ‘finishing line’ but I often do at the end of a run whatever the distance when the end is in sight. Really pleased with the long run. 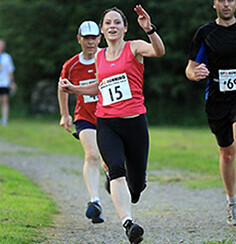 It might be interesting to try a negative split next time – try the last 10 miles at race pace. Sounds a little bit like hell though.